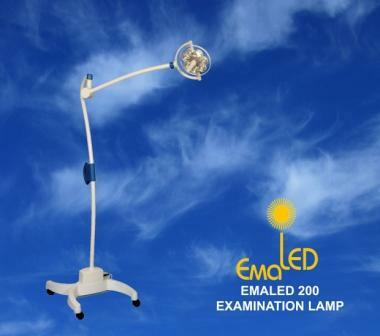 The new examination light EMALED 200 for the examination and treatment room EMA-LED GmbH is enlarging its product range of surgical and examination lights. The light head of the examination light EMALED 200 is characterized by the fully gimbaled suspension system being unique for this category, by its high mobility and the optimal positioning at the everyday work. Thanks to the possibility of the mounting of the light up to the ceiling, onto the wall or at a mobile chassis we are able to achieve great flexibility for the user. With 7 LEDs, the illumination intensity of 50.000 lx and the operating light field of 150 mm there is a shadow-free illumination of the operative field. The good color rendering index of the “cool” LED light of 92 Ra without infrared and ultraviolet rays as well as the near-to-sun light spectrum of 4.200 K care for the contrast and detailed view of the wound. The low energy consumption of only 15 W per light as well as the long life cycle of the diodes of at least 30.000 hours care for the lowest operating expenses.